What is your hidden power? How can you find it? Use it? What will you do in the face of a hate-filled foe, stronger than you? What can you do against hate and fear? In a world of energy most people cannot see, the Adima weave the web of light with every intentional act of creation. Kroledutz, enormous, powerful energy eaters seek only to destroy and are massing to take over both worlds, feeding on Adima and human alike. Standing between the Kroledutz and the destruction of the world are four New Mexico teens, outsiders. Rory has 2 fathers and has been in the new kid in school every year. Tima is the only African American in school, daughter of a single mom coping with depression. Billy, a smart mouthed math wiz is the son of a drunken, abusive mother. James is 3rd gen Japanese American. 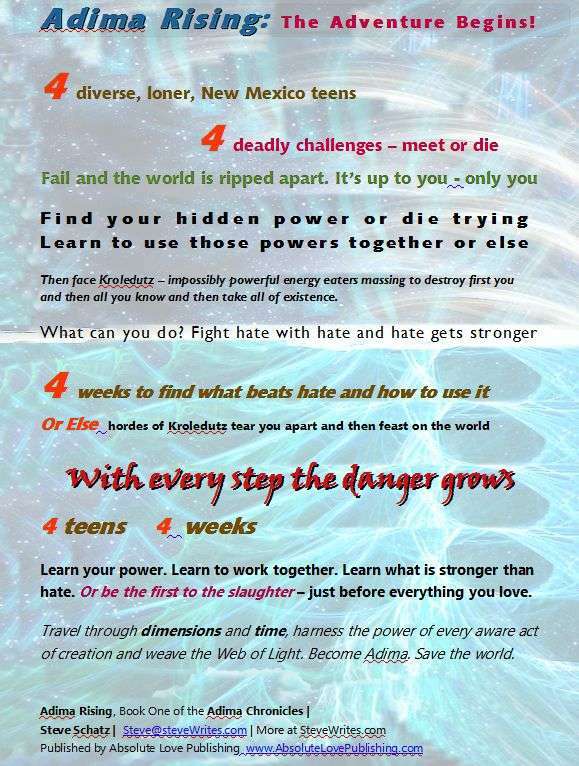 Unaware of their hidden powers or the world of energy, they must discover their inner strengths within four weeks or all is lost. Their only chance is to survive four challenges designed to force them to use their powers or die. If they somehow survive, the Kroledutz wait to tear them apart. As they inch closer to their goal, attacks and complications in both worlds threaten to crush the friends.